Working in a butterfly garden and free-flight exhibit gives me daily chances for butterfly photos, and I’ve taken hundreds (if not thousands). Along the way, I’ve developed a few tips that work for just about everyone, even if you have a simple camera. My camera is not a professional level camera, or even an SLR, and I almost always use automatic focus instead of manual, but you don’t have to have a fancy camera to take good pictures. Here are a few butterfly photography tips, along with some of my favorite pictures. DO take a lot of pictures. The great thing about digital cameras is that you can take all the pictures you want without worrying about wasting film. I often find that for every one good picture I take, I wind up discarding dozens, if not more. DO start from far away. Like all wildlife, butterflies are easily spooked. Some of my best butterfly pictures are actually from several feet or even yards away, because the butterfly was unaware of me and simply going about its business. You can always crop and zoom your photos later in an editing program. I took this photo of a White Peacock from about 15 feet away with my zoom lens and later cropped it. Start from far away and use your zoom lens to get your first set of pictures. Slowly move a few steps closer and take another set, and then a few steps closer, and so on. If you’re lucky enough to get up close without the butterfly flying off, zoom back out and switch to “Macro” mode, if you have it (see below). DO use your camera’s settings to your advantage. Even simple digital cameras and even cell phone cameras these days have a “Macro” mode, which often looks like a tiny flower on the settings. This mode allows your camera to automatically focus on the object close to it, often within just a couple of inches. If you’re able to get close, be sure to switch to this mode for butterfly photography. When this Monarch allowed me to walk right up to it, I switched to Macro and took some great detail shots. Another useful setting is “Action” (or something similar), which lets your camera focus on objects in motion. Some butterflies hold still while they feed, but others never seem to rest at all; using action mode can help make your picture more defined. 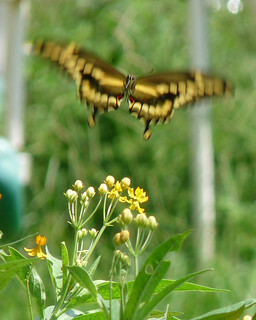 This shot of a Giant Swallowtail isn’t clear, of course, but the action mode helped capture more than just blur in the air. DO take photos in the early morning or late afternoon. Butterflies rest at night, and don’t begin to stir in the morning until the sun comes up. If you catch them while they’re warming up for the day, you’ll usually find them with their wings open to catch the sun’s rays – these are great photo opportunities. This Queen was basking in the sun on a cool winter morning here in Florida. By late afternoon, when temperatures are high, butterflies may seek a quiet spot to rest – this is another good time to capture them. Resting butterflies generally hang upside-down with their wings closed – a great time to photograph the underside of their wings. I caught this Gulf Fritillary at rest before a rainstorm. DON’T touch or try to manipulate the butterfly. 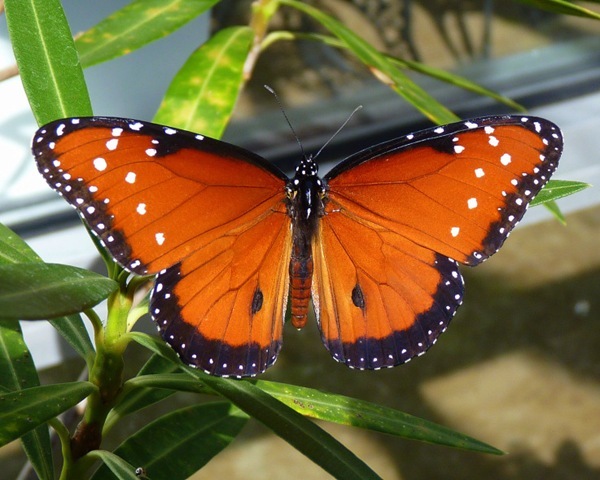 Butterflies are fragile, and your fingers can easily damage them. Don’t poke the butterfly to try to make it open its wings, or fly to a better position. Be a responsible nature photographer; capture what you see, not what you want to see. While these photos are of course not as good as those that professionals take with advanced equipment and training, I feel pretty proud of them. Try these tips out, no matter what type of camera you have, and see if they help you too. And if you have another good tip for butterfly photography, please drop by the comments and share it with us! I love taking PICS of butterflys.I have gotten meany and I have been trying to get one for three days of a pip-vine,I think.But no luck yet…..NOT GIVING UP!!!!! !I love your PICS.Thanks for the TIPS. Great tips. I have been building a collection of butterfly photos of my own. Practice makes perfect that’s for sure! Don’t put yourself down… noticed at the end of your comments you mentioned that your photos are not as good as professional. Yes…they are. These were fantastic photos and every bit professional quality. Glad you shared! Enjoyed every one. I agree! Jill’s photos look very professional! I’m envious! Does anybody know what type of plant that is in the first photo above, with the curled up bud supporting the butterfly? Thanks for the tips! I “cheat” by raising monarchs and releasing them, so I have plenty of opportunities to take photos both along the life cycle and on release day, too. Taking photos in the wild is so much more challenging. The Cassius on the fern is spectacular, by the way! We had a flightless monarch that we kept as a pet, and I actually set up my homemade light box to do a shoot with him. Even with everything in my favor, it still took me about 300 photos to get just this handful of pics! Thank you very much for the excellent tips. I have also been increasing my butterfly photo collection, and added three new ones to our backyard in Random Lake, Wisconsin, this year (30 mi. north of Milwaukee)…Mourning Cloak, Aphrodite Fritillary, and Great Spangled Fritillary. I see you have gorgeous butterflies in Florida! I’m envious. Last year, we saw the Giant Swallowtail, but not this year. I think our very hot and dry summer may have something to do with it. We’ve had a few Monarchs and Eastern Tiger Swallowtails, but not as many as in previous years. One tip I’d like to share is that I try to capture the butterflies when they’re in the shade, in order to get their true colors. One exception was the Aphrodite Fritillary, which was really pretty in the sun. The Mourning Cloak first attracted me with its dark brown wings, outlined with cream-colored lacy edges and blue spots. In the sun, its wings had a reddish cast and the blue spots weren’t as vibrant. I switch between two of my lenses for close-ups, and use “sport mode,” especially if it’s windy. I appreciate your tip about looking for butterflies in the morning. Hadn’t thought of that. Thank you! Wow! I thought I had been taking pretty good pictures of butterflies, but yours are beautiful. Will try the tips. Thanks so much. Good sound advise! One thing that I have found helpfull is a set of extention tubes, I use the 36mm tube with my cannon 100/400 zoom lens, it allows me to get closer to the subject and shoot a full frame image. Your Cassius Blue is outstanding! Thank you, I love the section on photography of all things in the wild. Please keep it up, I now look forward to this each month. Later, I’ll submit my photos (once I figure out how to send them to you).